Derma roller refers to a medical microneedling device, which is used for naturally stimulating the production of collagen in the skin without causing damage to it. Dermaroller is often used in the treatment of acne scars, removing stretchmarks, anti ageing and for hair loss management. 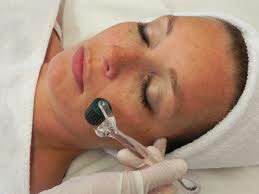 In this procedure, each needle-column of the derma roller will penetrate into the dermis of the skin. This will swiftly close, allowing the skin to recover quickly. Derma roller treatment naturally stimulates the skin creating a beautiful, brighter and younger looking skin. The treatment is performed under topical anesthesia. The treatment could cause temporary redness of the skin which might last for up to 4 hours following the treatment. The dermatologist may recommend sunscreens and numerous other adjuvant treatments. It is advisable to do a follow up after 3 weeks. It can take up to a period of 6 weeks for any obvious signs of regeneration and repair. The practitioner will generally recommend a series of 3 to 4 treatments with a gap of around 6 weeks between them. Immediately after the procedure, your skin will appear as though it was exposed to mild to moderate sunburn. Your skin may feel warmer and tighter than normal. This will usually subside after 3 - 4 hours. Our practitioner will quickly apply cream after the procedure. You should use this cream until the redness has cleared. You should not apply makeup for at least 12 hours following the procedure. Tepid water must be used to cleanse the face for 48 hours after the procedure.